To Brenda Oakes, mother, lgbt-rights campaigner, co-coordinator of Friends and Families of Lesbians and Gays as well as Manchester Parents' Group. From Ingrid F.
I just learnt about you today in a Dear Friend Workshop. I wish I had someone like you in my life when I was a teenager. 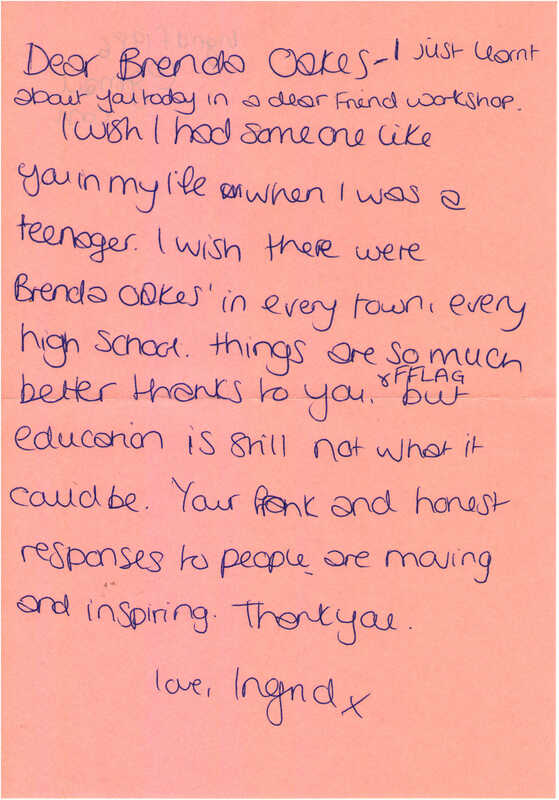 I wish there were Brenda Oakes’ in every town, every high school. Things are so much better thanks to you and FFLAG but education is still not what it could be. Your frank and honest responses to people are moving and inspiring. Thank you. mother, lgbt-rights campaigner, co-coordinator of Friends and Families of Lesbians and Gays as well as Manchester Parents' Group. Born 1930, died 2014. More information about Brenda Oakes.